Chiang Mai was founded in the 13th century and one or two days will not do this amazing city justice. Ideally four nights and five days will give you enough time to explore and get a true sense of Chiang Mai. Chiang Mai was founded in 1296 and is located in an area of majestic mountains. This city was the capital of the Lanna Kingdom and remains a religious and cultural centre. Vestiges of moats and walls still remain as a symbol of the historical significance. Chiang Mai is the home of of elaborate Buddhist temples numbering in the hundreds including the carved serpents of the Wat Chedi Luang from the fifteenth century. Thailand is the place to meet the elephants, enjoy their gentle nature, the place to shop for unique items and gifts at Chiang Mai’s Sunday Night Market and the place to discover entirely new experiences. It is best to arrive early in the morning whenever possible to truly enjoy your first day in Chiang Mai. The Old City is shaped like a square and offers gorgeous shops on Mun Mueang Road and Sri Poom Road. Traditional wicker crafts can be purchased and the narrow roads are filled with restaurants, bars, markets and shops. In the centre of the Old Town are the temple ruins of the Wat Chedi Luang. This is just one of the numerous temples on the Mahamakut Buddhist University campus. Enjoy lunch at the Amrita Garden. This lovely restaurant is in a quiet residential area. This is a traditional Thai structure with a homey atmosphere, large windows and sensational food. Some of the most popular dishes are the vegan cheese board and the decadent desserts. After lunch, visit the Thapae Gate. The Old City has four gates from Chiang Mai. The Thapae Gate faces the Ping River. During the 1980's this gate was completely refurbished. This gate leads to another time filled with Buddhist monks, ancient temples and fantastic food. Your next stop is the Three Kings Monument in the centre of the city. This monument is of the three kings who founded Chiang Mai. These kings built the city during the thirteenth century. This monument represents the city so well, it has been reproduced in numerous forms throughout Chiang Mai. By walking north along the moat, you will reach the Sompet Market on the corner. The food stalls sell fresh vegetables and fruits and vegetables from the Thai farms. This authentic Thai market is unique to the culture and offers smoothies, hot dishes and delightful snacks. Traditional transportation in Chiang Mai is a Tuk Tuk. This is a small vehicle with three wheels. This is an excellent way to experience the real Thailand. You can explore the city and try Khao Soi Khun Yai for dinner. The translation is Grandma’s Chiang Mai Noodle. This soup is renowned and made from coconut curry and golden egg noodles. The dish is completed with meat and vegetables. The finishing touch are the crispy noodles. This traditional dish is made with beef, pork or chicken and includes a side of lime, chilli flakes, onions and pickled cabbage. Begin your adventure by visiting one of the coffee shops. The coffee beans are freshly picked from a local plantation. A nice selection of breakfast foods are also offered. Head to the north side of town and the Chang Phueak Gate. You can reach Wat Doi Suthep by taking a red Songthaew. You will reach the beautiful hills above the city. The Wat Doi Suthep is one of the most beautiful temples in the city and surrounded by lush green hills. The lights from the city illuminate the temple in the evenings. Spend the afternoon taking an elephant tour. The Elephant Jungle Sanctuary is a two hour drive and worth every single minute. You can spend time with the elephants, bathe them and feed them. There are very few things cuter than a baby elephant. The Elephant Nature Park is another option and you can even schedule a tour. From here, spend a little time walking around Chiang Mai, enjoying the friendly locals, the lovely scenery and the marketplaces. Enjoy a nice meal at one of the stalls or see what a trendy Thai restaurant looks like at Tong Tem Toh. This is alfresco fare served under large umbrellas at quaint wooden tables. Enjoy your meal as you listen to lively tunes beneath vibrant plants, cooling fans and a nice tropical feel. The dishes are spicy and include seafood, meat, soup and curry. This is a good place to just relax, spend some time and enjoy Chiang Mai. You can take a nice stroll back to your hotel or enjoy a Tuk Tuk and the evening atmosphere. One of the most efficient and fun ways to explore Chiang Mai is by renting a scooter. This will enable you to visit the locations a little off the beaten track. Your first stop is the Mon Tha Than waterfall. The sight of water cascading through nine levels of the forest will take your breath away. This waterfall is located beneath Wat Doi Suthep at the base of the hill in Doi Suthep-Pui National Park. It is easiest to reach by scooter or car. Time loses meaning as you navigate the narrow road reach the first level. You can take a dip in the serene pools formed by the waterfall. On your way back Chiang Mai, do not miss the Huay Kaew waterfalls. The cascades are smaller but there are numerous hiking trails. Afternoon it is time to see more of the historical temples. Wat Phra Singh is the Temple of the Lion Buddha. This is where young monks congregate to study. In addition to the grand lion statue, the temple is surrounded by smaller lion statues. The old library protects valuables from floods with a stone floor and Thai festivals are held here throughout the year. The oldest temple in the city is Wat Chiang Man. This temple houses the oldest statue of Buddha and the architecture reflect the Lanna style. This is where the yearly rain festival is held each year on April 1st. The two Buddhas in this temple are the marble Phra Sila Buddha and the White Emerald Buddha. Day four is meant for learning to live like the locals. Start your day in Chiang Mai's trendiest area, the Nimmanda Haeminda. You will find the coffee shops filled with working digital nomads and bars offering the tastiest cocktails. This area offers a wide variety of street art and cafe hopping is highly recommended. Take the time to walk through the streets, enjoy the lush scenery and talk to some of the locals. Sample some of the local food, have a smoothie and learn what life is all about for people living in this glorious city. After lunch, make your next stop Wat Umong. This underground temple structure is inside a hill. A serene lake and lush garden surround this exquisite temple. There is no charge to enter this temple. You will walk through several residential areas of Chiang Mai on your way to the temple. They are very different from the buildings in the Old Town and provide an excellent glimpse as to how the locals live in this area. Next, travel to the Baan Kang Was. This is a unique artists village where meeting local artists is always a possibility. You can watch the artists as they make their crafts and find some lovely souvenirs to take back home. After all the walking you will have done, take a break at No 39. This little oasis encompasses a modern event space, a small village shop, a music shop, a coffee shop and a small vintage shop. There is a charming pond with a small stage looking out over the pond, outdoor seating and an amazing cabin. The cabin provides extremely comfortable seating, an incredible slide and an excellent opportunity to take photographs of your trip. Finish off your day with an enticing meal at the Khantoke in the Chiang Mai Cultural Centre. The atmosphere is charming, the traditional Thai dinners are exceptional and you will enjoy the dancing show. There is a large selection of northern Thai food including dishes prepared with Burmese-style pork curry, chicken curry, sticky rice, fried chicken, vegetables including a spicy chilli dip and deep-fried pork skin, the local delicacy. Time to think about the places you have not yet seen and make the most of the time you have left. The first place to consider is a small market located just outside the temple of Wat Phan. You will find it in the courtyard and see a lot of tempting food stalls. The local vendors come to offer their crafts and arts. These are beautifully displayed on the surrounding tables. This market is not nearly as large as the Night Market, but you will enjoy the shopping regardless. There are not as many crowds so it is much easier to see everything being offered. Chiang Mai offers a fairly wide selection of cooking classes including traditional Thai cuisine and classes specifically for vegan cooking. This is an incredible way to take home the tastes and aromas of the city. You can purchase your favourite spices at one of the marketplaces for a bit of authenticity. If you have a later flight, do not miss the Sunday Walking Street. This famous street is open every day from 4 p.m. through midnight. You will discover a unique and interesting selection among the merchants. The food stalls are amazing and you will find souvenirs, sculptures, jewellery and clothing to name but a few. This is where the local talent gathers to show their art and handcrafts. You can also have a lot of fun bargaining with the merchants to try and get a better price. Sunday Walking Street also features groups of street entertainers who put on quite a show for the visitors. The entertainments lasts throughout the evening. Since Ratchadamnoen Road is closed during the Sunday market due to traffic, you can relax and enjoy yourself without having to worry about the traffic as it passes. This is your last chance to try a new delicacy, savour a local drink or find the perfect gifts for the special people in your life for when you return home. 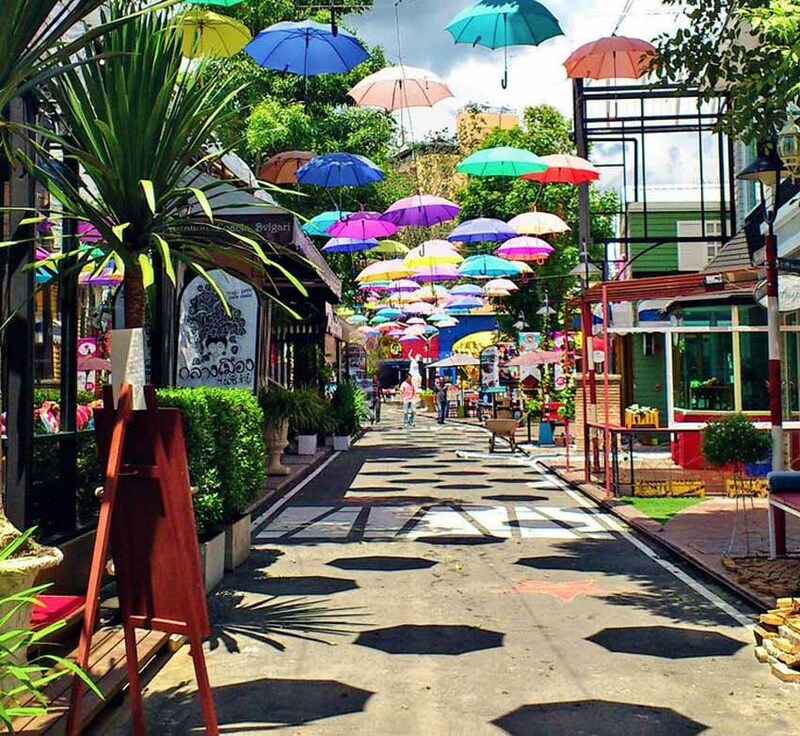 Visiting the markets is one of the most enjoyable experiences in Chiang Mai. Remember to take one last look at the beautiful evening lights of Wat Chedi Luang as you leave. The Lanna Folklife Museum is fairly close to the main gate on your left. This is where you will find the Lanna Folklife Museum. The museum is beautifully done in a white colonial style and encompasses a life recreation of a Lanna village. These life sized dioramas explain the traditions, symbols and habits of the Lanna people in a magnificent series. This is an incredible way for the entire family to learn about the Lanna people. It is also an inexpensive way to spend some quality time. The Chiang Mai City Art and Cultural Centre is not far from the monument. This museum is a fascinating way to learn all about Chiang Mai and the history of the city. In 1999, this museum received an award from the Royal Association of Siamese Architects for the architectural design. The exhibits show the way the city developed and grew. This explains how Chiang Mai transformed into a modern city. There are cultural and historical artefacts on display from the early Lanna villages. Part of what makes this museum so interesting are the exhibitions of interactive audiovisual displays, old artefacts, maps and photos. The price of a ticket includes access to the Lanna Folklife Museum, the Historical Centre and the Arts and Cultural Centre. Create your own itinerary around your particular interests with the following resources. One of the best parts of Chiang Mai is its wealth of great museums. Whether you are interested in art, history, science, politics or war, there is an excellent museum for you to visit in Chiang Mai. Nimman offers exceptional shopping in markets, shopping malls and individual boutiques. A wide variety of unique stores are located just west of the Old City of Chiang Mai. The majestic Ping River intersecting Chiang Mai is certainly worth visiting if you have time during your stay in Chiang Mai. Whether it be a river cruise or dining on the river bank. This city is one of Thailand's most popular shopping destinations and has been throughout time. Chiang Mai has its fair share of shopping malls and stores, but the real attraction here is the proliferation of markets. If you're in the market for that memorable souvenir or just a great plate of food, head over to one of these incredible markets in the city. akyra Manor is a boutique five star hotel in Chiang Mai. The rooftop bar serves international and Thai cuisine, speciality pizzas and delectable cocktails. This is where the international connoisseurs gather. The infinity swimming pool is a tranquil escape from the busy street outside. The hotel also offers an exceptional wine list. akyra Manor is one of the boutique hotels where the creation of every room was based on the concept of a courtyard within the room. This luxury hotel offers 23 suites with privacy and a little of the outdoors in every room. The amenities include cable, large LCD televisions, an iDock and iPod including Bluetooth speakers and a big music library, a safe in every room, soft and luxurious towels, natural cotton slippers and bathrobes, a modern espresso coffee machine, a fully-stocked mini-bar, facilities for making both coffee and tea, naturally sourced toiletries, 430 thread-count Egyptian cotton sheets, free wi-fi connectivity at the hotel, air conditioning fully adjustable in every room and a hairdryer.